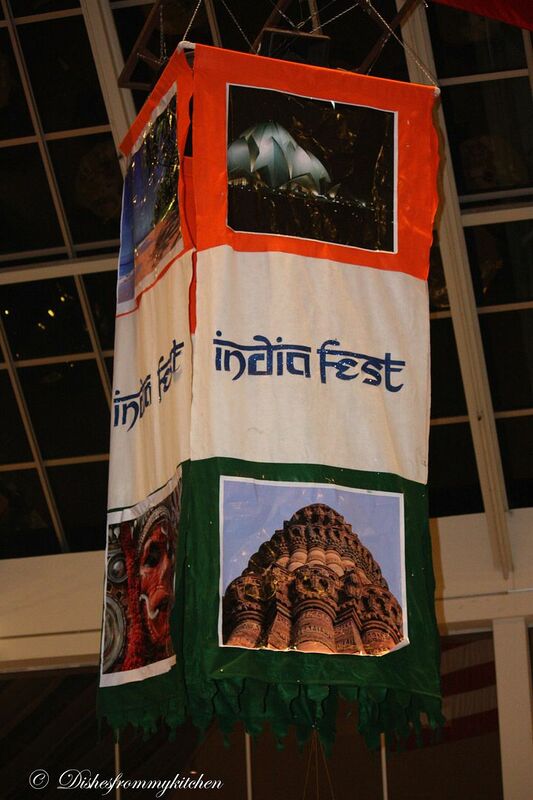 The whole of last month was pretty busy with so many activities going on with regards to the India Fest. But I enjoyed so much doing 2 demos, Food booth activities, Pictures I shot for the Souvenir book. The name of booth was Dishesfrommykitchen.com . 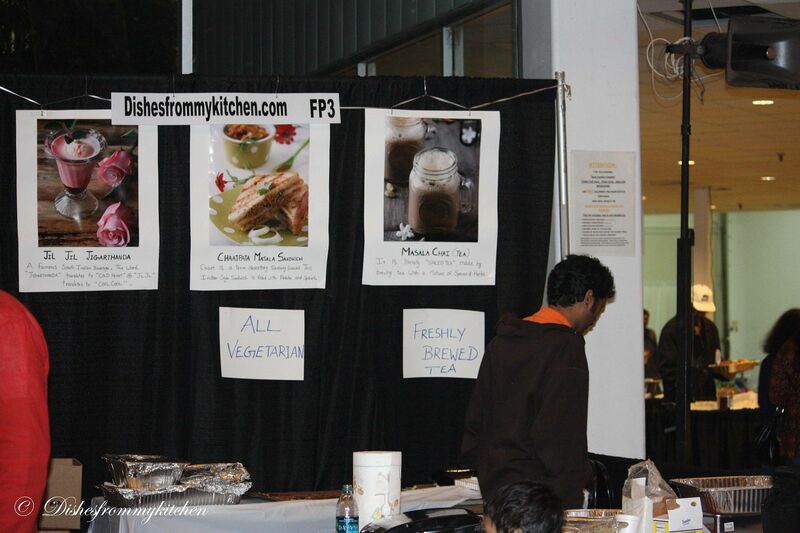 My Masala chai and Jigarthanda which we had in our food booth was super hit in the India fest and everybody enjoyed it. The Demo which I did in India Fest went very well and I did in the Theme of heritage so I showed the basic south India seasoning of Garbanzo beans and the Moong Salad. The recipes for the Garbanzo beans and Moong salad are here and here. The people who attended the demo really enjoyed and loved the taste. Unfortunately I don't have much pictures of India fest as we were really really busy with the Food booth; we didn't even have time to breath. I took the pictures only after the closure but I am yet to get the pictures of the Food Demo from the IAM team. Anyway here I am sharing the few pictures which I took at the end of the day. One more good news is that November 5th was my blog anniversary and the same day was India fest, it was like we celebrated the blog anniversary through India fest. 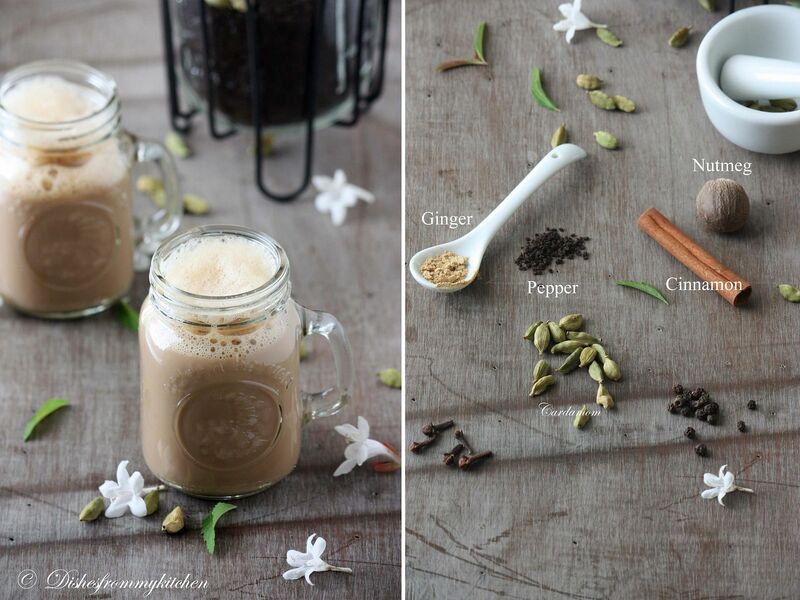 As requested by many people there in India Fest here is the recipe for Masala Chai. 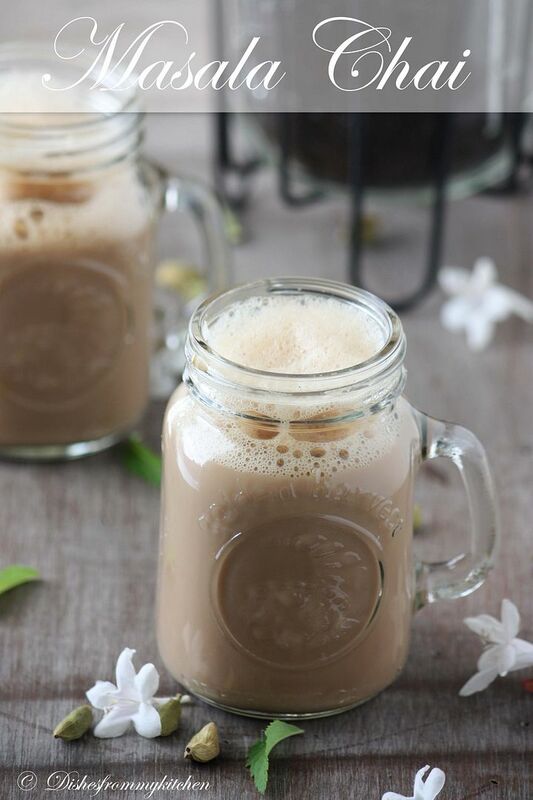 Masala chai (literally "spiced tea") is a beverage from the Indian subcontinent made by brewing tea with a mixture of aromatic Indian spices and herbs. This is for 2 glass of Chai. You can also use all the above spices as well. Here is another Tea Masala you can grind in your leisure and store in airtight container. Dry roast all the above ingredients till you get nice aroma. Do not over roast. Cool them and make it to fine powder and store it in the air tight container to ensure freshness. Add a tsp of this ground tea masala and tsp of fresh grated ginger( If you are not grinding dry ginger while making Tea masala ) while making tea. 1. Add the tea powder/dust in the water, add the cardamom and Ginger and let it come to rolling boil. If you are using tea masala add it instead of cardamom and ginger. 2. Close and keep it aside for 15 minutes. 3. Add the milk to the decoction, add sugar. 4. Let it again come to nice rolling boil again. 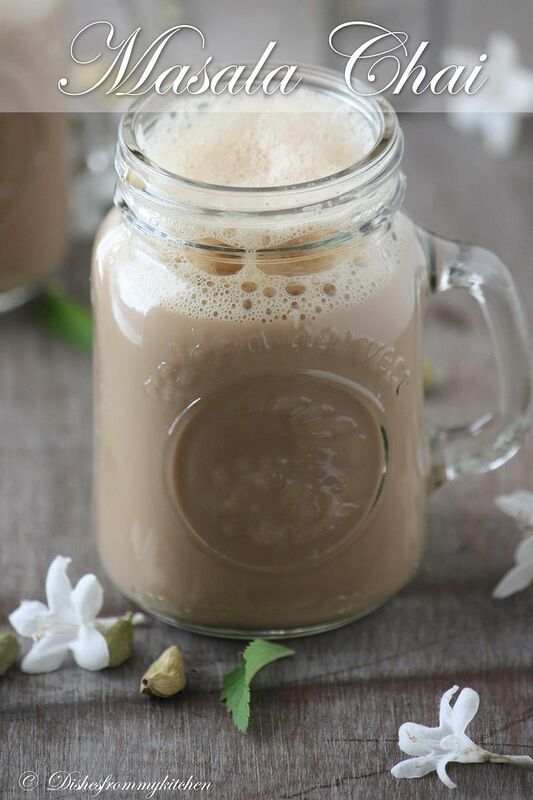 Enjoy the Delicious and soothing Masala Tea/Chai. 1. If you need the chai to be strong increase the amount of tea powder. 2. Add milk according to your preference(more or less). The milk and water ratio depends on the individual preference. Some prefer more milky tea some with not much of milk. In that case you can use water and milk ratio according to your choice. 3. Depends on the strongness of the tea powder, add it for making decoction. The event must have been fun. Congratulations for success with everything. This tea looks delicious! I´ve never try this way! I´ll take note. Congratulations. I love all your pictures!! And the tea mug - I love it. Where can I get one? Wow... Amazing photography.. great job..
Oooooooooo so that ready-made Chai Masala powder consists of these things!! Now I get it! Finally I came here for commenting. How lazy am I? BTW, I wanted to tell from long time back, You have nice blog, Beautiful pictures and lovely recipes. The cute cups of masala chai is superb and I hope you enjoy the event in which you participated. Happy going. 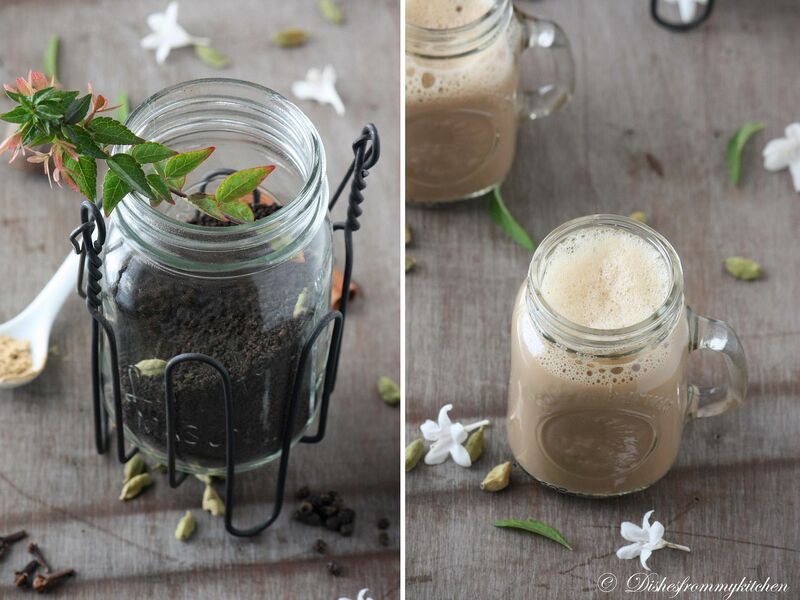 i used make this chai in weekends...my hubby likes it very much...nice pics!! I am a tea addict, so much that I want masala chai only! Gladly i can find masala chai easily in Singapore! Your photos are so lively :) Wonderful illustration! Wow amazing pics.U done a great job dear.I am tea addict dear.Twice a day.During cold weather i used to prepare the masala tea.But never add the nutmeg. awesome clicks n love the chai n mug spcl..
congrats for d fest and nice to know more abt it..
Wat a prefect chaai, love it anytime. congratulation for the fest dear!!!!! Glad the fest went on well Pavi..And these are fantastic clicks!!! Many congratulations on your blog birthday! Looks great.. Hope you had loads of fun.. Event must have been fun. I am glad you enjoyed yourself. Love the masala chai. great pictures. About the salad recipes i could not access the link. Can u check that please.